Easter in France is a great time to visit. It marks the beginning of spring when the weather starts to turn warm and things start blossoming. It also marks the beginning of the high season for tourism. On Easter, the custom of French culture is to greet each other with “Joyeuses Paques” or “Bonne Paques” meaning, happy Easter! The best way to learn French is to join in and great each other the same way. 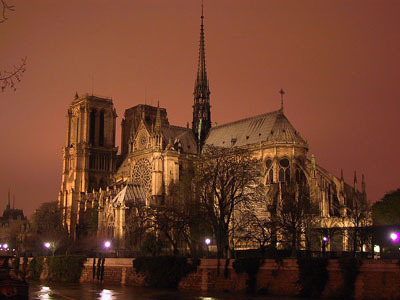 The Cathedral of Notre Dame de Paris houses Jesus’ crown of thorns and pieces of wood and a nail from the cross. The climate in Paris France is quite agreeable this time of year. 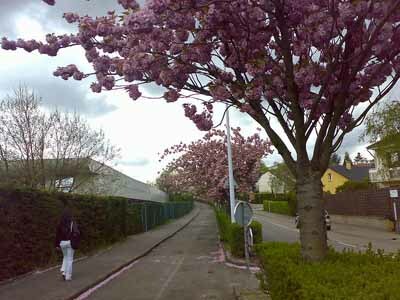 Springtime in Paris? Paris boutique hotels offer a great option. 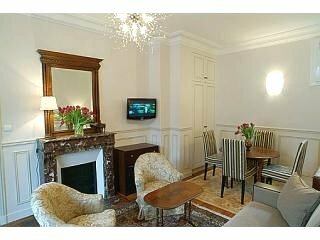 Paris budget hotels offer good accommodations at a reasonable price. No rabbits will bring you Easter eggs unless you live in Alsace. But do not fret; you will still get your Easter treats. As per French traditions a flying bell returning from Rome filled with chocolates and Easter candy will drop them from the sky into the backyard of every child in France. French cultures and traditions vary sometimes according to region. In some parts of France the eggs arrive by chariot pulled by a team of white horses. The culture of France is so rich and delightful to explore. What’s not to like? On the Friday before Easter (Good Friday) all the church bells in France fall silent. As per French traditions the church bells fly to Rome to see the pope and return home on Sunday. There is a very funny story about this bell vs. rabbit cultural difference in the book by David Sedaris, “Me Talk Pretty One Day ” which I heartily recommend. He offers funny observations on his experiences learning the language and the culture in France. Practically all businesses are closed that are usually open on Sunday. Double check schedules before you plan your day. Ok there is rabbit activity it seems. Children build nests in their backyards and a rabbit comes in the night and deposits colored Easter eggs. Kids also play games at Easter. They roll raw eggs down a slope. The winner is the surviving egg. It symbolizes the stone rolled away from Jesus’ tomb. In another popular game the kids toss raw eggs into the air. The first one to break and must forfeit a piece of Easter candy to the winner. 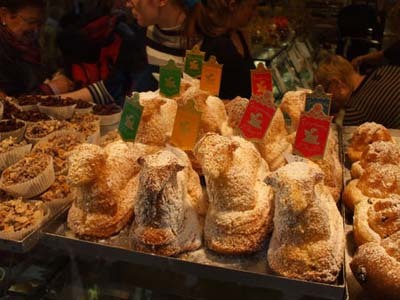 In the windows of shops you’ll see chocolate eggs, bells, rabbits. There seems to be no overlying traditional French Easter meal. Lamb is very popular and also pork. As with my French family the celebration meal is usually eaten at noontime. La Gâche de Pâques for dessert which is like a brioche. This is the Tuesday before Ash Wednesday (the beginning of Lent). Lent is about a month before Easter where one fasts and tries to be extra good. 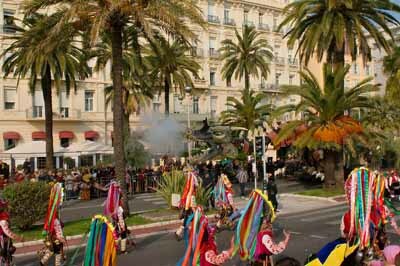 In Nice Carnaval (mardi gras) lasts for 2 weeks. There is a lot of fun activity like parades, balls and fireworks. Nice started the first Carnaval back in the Middle Ages. Each year there is a new theme. Visit Carnaval and take in a French beach. French Riviera beaches are warm and beautiful. In other parts of France, on Fat Tuesday or Ash Wednesday, a puppet in the guise of “his majesty” is burned on the town square. In Bessieres in the Pyrenees they make a 15,000 egg omlette and hold a town meal. In other parts of France families may serve a regular size omlette for dinner. 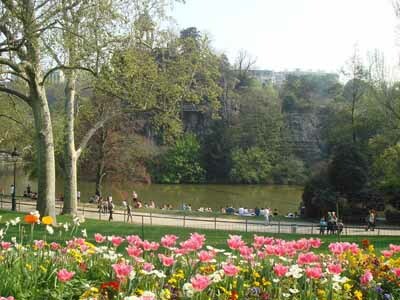 If the weather is good lots of French go on picnics. In Corsica there is a parade in Cargee. 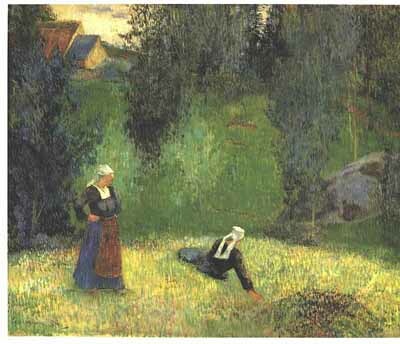 Afterwards the fields are blessed for the coming planting season. April 1 is April Fools Day. Poisson d’Avril in chocolate form appear in the shop windows. And paper fish are the April Fools joke children have lots of fun with. They stick a paper fish on the back of an unsuspecting friend or adult. This Poisson d’Avril tradition is thought to have started centuries ago. They sent someone to the fish market for a fish that was not in season or available. Ha ha.